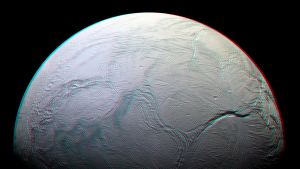 THE EXCEPTIONAL ENCELADUS. On Wednesday, scientists from the Southwest Research Institute (SWRI) published a paper in Nature outlining their discovery of complex organic molecules on Enceladus, one of Saturn’s 53 moons. These large, carbon-rich molecules emanate from the ocean beneath the moon’s icy surface, escaping as plumes through warm cracks. This emergence of complex organic molecules from a liquid ocean makes Enceladus the only body besides Earth to boast all the basic requirements for life as we know it, said co-author Christopher Glein in a news release. HELP FROM THE DEPARTED. For their paper, the scientists relied on data from NASA’s Cassini spacecraft, which plunged into Saturn’s surface in September 2017. During a flyby in 2015, the craft detected hydrogen within the materials emanating from the cracks in Encledaus’s surface. Hydrogen sometimes serves as an energy source for microbes living near hydrothermal vents in the Earth’s oceans, so the researchers suspect that Encledaus’s hydrogen formed due to the moon’s own hydrothermal activity. ANOTHER STEP FORWARD. This isn’t the first discovery of organic molecules on Encledaus. However, previous discoveries were of simple molecules with masses below 50 atomic mass units — these newly discovered molecules have masses greater than 200 atomic mass units. Still, a single atom of carbon-12 is 12 atomic mass units, so these “complex” molecules are very tiny. While this might not be the discovery of extraterrestrial life many are waiting for, these molecules do bring us one step closer to finding it. As Glein noted in the news release, future space missions could provide more in-depth analysis of Encledaus’s plumes, perhaps helping scientists figure out exactly how the moon’s complex molecules came to be and what sort of biological processes are happening beneath its icy surface.